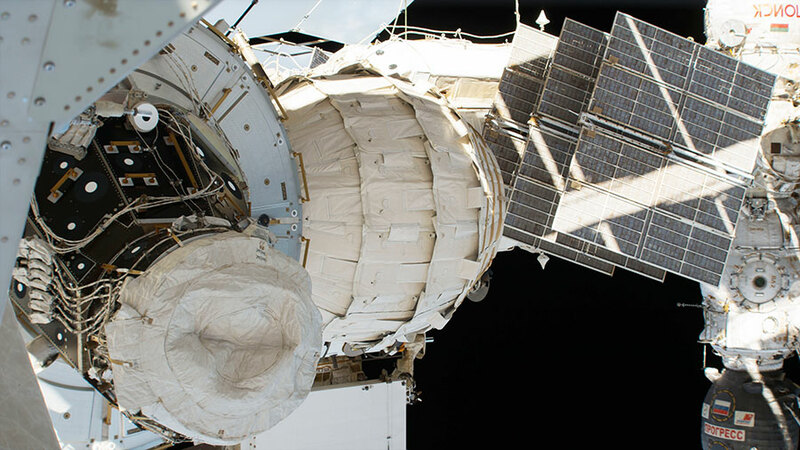 BEAM, the Bigelow Expandable Activity Module, is pictured installed on the Tranquility module and expanded to its full-size volume. Flight Engineer Kate Rubins opened up and entered the Bigelow Expandable Activity Module this afternoon. She temporarily installed gear inside BEAM for a test to measure the loads and vibrations the module experiences. Rubins started her day with a performance test on a mobile tablet device then videotaped her observations of the living conditions aboard the space station. Given the experimental nature of BEAM, does entry to the compartment require a space suit and/or airlock? There is a hatch that is closed when the crew is not checking BEAM. Otherwise, no spacesuit or airlock is needed to work inside BEAM. Good question. “In the Russian side of the orbital laboratory”. Please don’t tell me we’ve drawn borders inside the ISS.